One of my favorite places to eat is Pluto's (a chain in Northern California) because they have these stations where you can either get fresh tossed green salad made to order, meat plates, sandwiches, and even hearty vegetarian dishes. The set-up of this place is brilliant, from the menu, stations, and to-go or sit down options. I can get a fresh tossed salad with whatever seven fixings I want in it with a side of fried potato rings, onion rings, chicken wings, or even mashed potatoes. I know it sounds odd but sometimes I like a side of mashed taters with salad. If you're into chicken wings, their BBQ wings are awesome. I get them as often as I can. 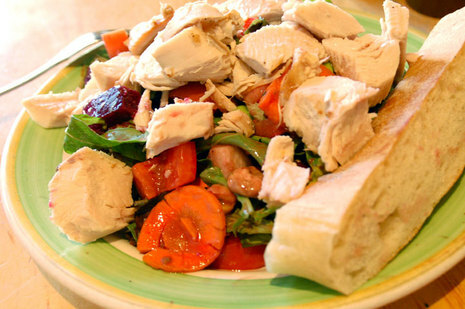 Above is salad I ate the other day which had mixed greens, beets, jicama, carrots, mushrooms, tomatoes, garbanzos, and carmelized onions topped with a healthy heap of Herb Roasted Sonoma Turkey and mixed with honey mustard dressing. Just to give you an idea, the plate above is their side dish size, and it's pretty big. I ate half and brought the other half home. The full size is twice as big. Yeah, that's a whole lotta salad. 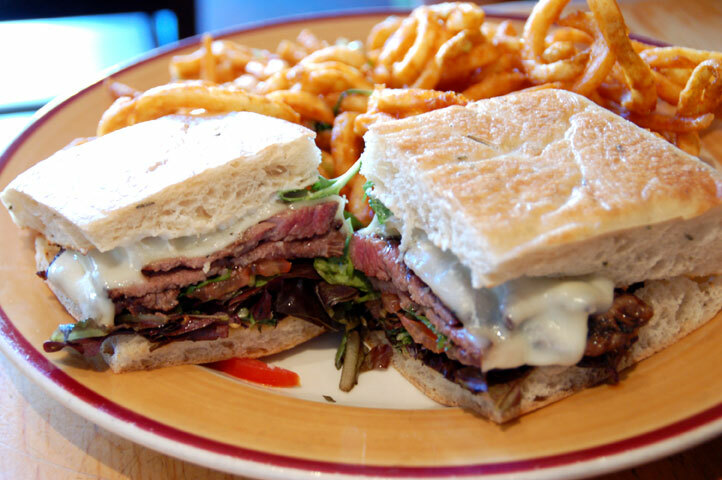 Pluto's is great for a casual first date because I the girl can have my typical first date food, salad with poultry as we don't want to feel too heavy on date #1, and my date can chow on some meaty sandwiches like this grilled marinated Tri-Tip with a side of potato rings. Yes, I'm being stereotypical, but come on, you've done it too. Perhaps absurd, but true. In first date food flirtation, I can pick off his rings. He can have a bite of salad, and aw, how cute. Then when we're done, there are a whole bunch of desserts in convenient single serving to-go packaging. Pluto's always has Rice Krispie treats and I can't help myself! If you have the chance, do check out Pluto's. Your tummy will be happy.